Disposition is the result of an idea I had over a year ago for sorting entries on the edit list page. It's something I've been meaning to get around to creating, but just kept pushing it off, then finally a few weeks ago started to put something together. Disposition adds sorting capabilities to the edit list page, but only to the channels you allow to be sorted via the extension settings. It manipulates the entry_date for each entry. Nine times out of ten when I needed to set a custom sort order to an entry, the date was irrelavent. Come to think of it, the date is irrelevant in most of the content I enter in to ExpressionEngine. So why not change the entry dates to set the order? By doing this no custom fields are needed, and depending on the order you wish to display the entries, no change is needed to your template tags either. I'm going to try an open beta with this one. It seems to work for Leevi Graham. I see the usefulness of this add-on, but I'm not sure of what a good price would be or how useful others find it. I'm not 100% decided if this will be free or commercial. I don't like the idea of charging for something that is stupid simple, but I've also learned just how much support goes into releasing an add-on (free or commercial), so I'm hesitant to release anything for free now. I feel like Disposition is not extremely simple, but not complex either, but if EllisLab ever decideds to add these hooks back I have a slew of other improvements I'd like to make and it would get significiantly more complex, but we'll see if that ever happens. Below is a link to download the zip file. Try it out, let me know what you think. Obviously report any bugs you may find through the contact page, and let me know what you'd be willing to pay for such a feature. Yes, there are limitations to this approach. 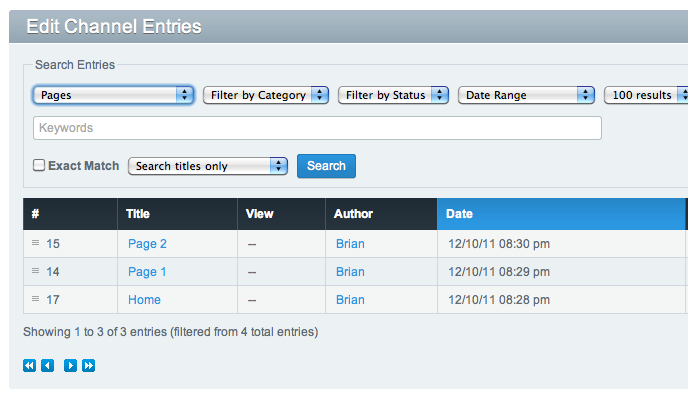 For example, if you have more than 50 entries it will be hard to sort because the edit list page only shows 50 per page. This is one of the reasons I'm doing an open beta to collect feedback.